Project CLEAN has worked 25 years to improve the safety, cleanliness and hygiene of public school restrooms and is the national leader in these efforts. 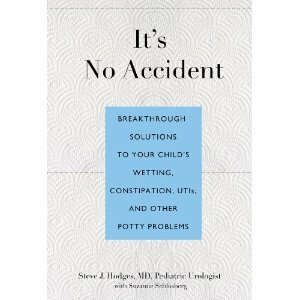 "It's No Accident: Breakthrough Solutions to Your Child's Wetting, Constipation, UTIs, and Other Potty Problems." by Steve J. Hodges MD and Suzanne Schlosberg. Click the image above to download a copy of the Commendation. To learn more you can read about it and see the video on our Media page. Led by Project CLEAN Coordinator, Dr. Tom Keating, 165 students in DeKalb County, Georgia studied issues dealing with school restrooms such as safety, cleanliness, privacy, and security. These young citizens then applied their findings to restrooms in public libraries, parks, recreation centers, and swimming pool complexes in their own communities. As a result of this unique approach and successful effort, the City Commission of Decatur, Georgia unanimously passed a commendation citing the "Decatur Youth Wellness Project." Can we do something to decrease the taboo about toiletry, school restrooms, poop? In this four-minute video, Dr. Steve Hodges, pediatric urologist, talks straight about the taboos of healthy living and the “Four E's” of wellness: environment, eating, exercise, and elimination. "True Dat": a skit about America's public school restrooms. "Imagine 20 middle schoolers — seventh and eighth graders — practicing for a spring dramatic performance in a suburban Atlanta. Not unusual, unless these boys and girls are performing the first skit in America about public school restrooms. That is unique. "Yet, in April and May 2007, in Clayton County, GA, selected Babb middle school students, an outstanding teacher, and Project CLEAN wrote, rehearsed, performed, and filmed a DVD about public school restrooms. "How did the topic of school restrooms — a national disgrace in America — go from a nasty little secret into a 20-minute skit (since performed for hundreds of students and educators from Clayton County to Calcutta, India?)." Check out other videos featuring Project CLEAN on YouTube. During January-March 2011, four health classes at Renfroe Middle School of the City Schools of Decatur, and one health class at Druid Hills High School of DeKalb County Schools System, both in Georgia, participated in a youth wellness project. Led by Project CLEAN Coordinator, Dr. Tom Keating, with special support from Director Greg White of the City of Decatur Active Living Department, these 165 students studied issues dealing with school restrooms such as safety, cleanliness, privacy, and security. These young citizens then applied their findings to restrooms in public libraries, parks, recreation centers, and swimming pool complexes in Decatur and DeKalb County. As a result of this unique approach and successful effort, the City Commission of Decatur unanimously passed a commendation 2 May 2011 citing the "Decatur Youth Wellness Project." Since each school system in the nation is required to update and improve its wellness policy, this approach, coordinated by Project CLEAN, offers a way to actively engage 11-18 year old students in improving their health, toiletry needs, and sanitation concerns and to foster wellness and citizenship in a meaningful way.